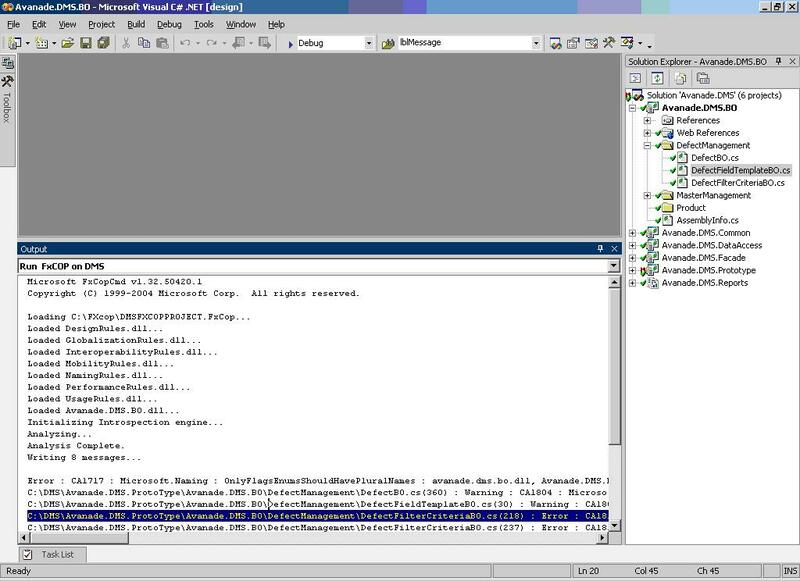 This article walks through the configuration required to integrate FXCop in the VS.NET 2003 IDE. Let’s have a quick primer on FXCop and understand the need for automated tools for code review. 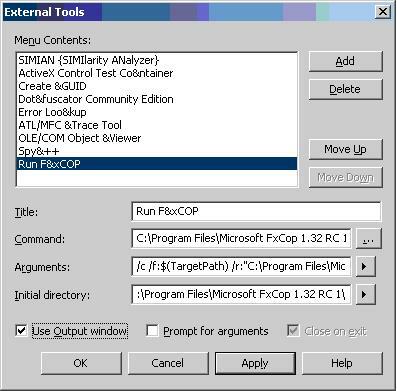 FXCop is a code analysis tool from Microsoft, which analyzes compiled .NET assemblies for compliance with recommended programming practices. 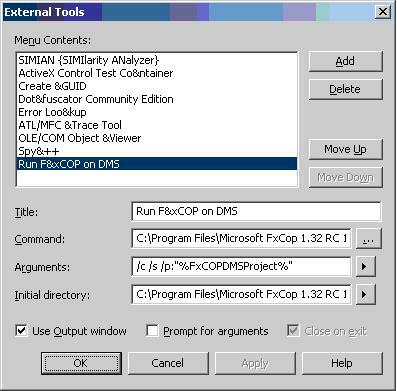 FXCop is “Framework Cop” in short; it can be operated in two modes: one is through a GUI and the other is through command-line mode. Microsoft has made a huge investment in .NET and in promulgating the best .NET coding practices through the .NET Framework Design Guidelines, which you can find at Design Guidelines for Class Library Developers used by the tool. FxCop aims to make it easy to comply by scanning compiled assemblies and creating a report that details coding errors (called violations), and suggests code fixes and improvements. Behind the screen, FXCop uses the Reflection technique to read the code of your assembly and process against predefined rules (around 200+ rules are defined) categorized as naming conventions, library design, localization, security, performance, portability, interoperability etc. The FXCop Introspection engine can be leveraged to develop custom FXCop rules specific to the project needs. The tool is free and is available for download here. The report generated by an FXCop run details the violations and the files, where they are found; these are then fixed by developers; the code is then committed and FXCop is re-run to check if the code has successfully passed through all the checks. It is desirable for the developers to know the errors before the code is checked-in, from within the IDE so that the entire cycle which switches between the FXCop GUI, the VS.NET IDE, and the source-control can be avoided. 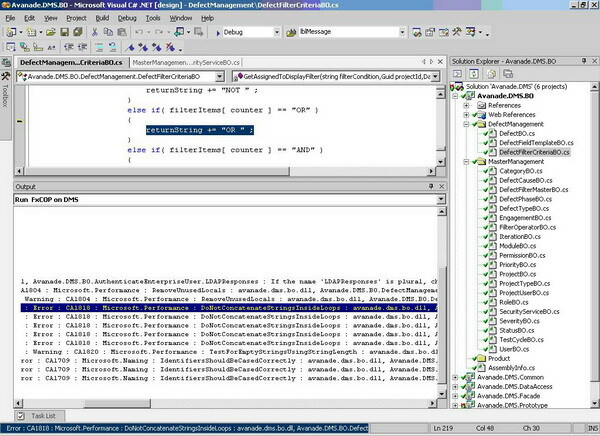 VS.NET 2005 has built-in support to run FXCop from within the IDE, as/when developer needs. 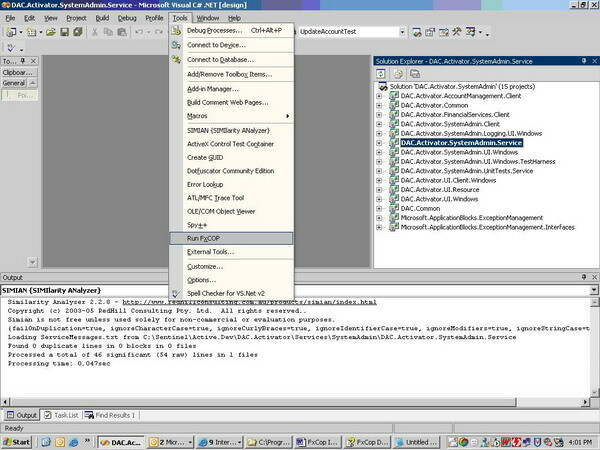 VS.NET 2003 needs to be configured for FXCop integration by setting up the FXCop command-line utility using the External Tools option in the IDE. The “External Tools” option provides a simple way to hook applications into the Visual Studio IDE. Title: Indicates suitable menu title, with a relevant short-cut key. Command: Path where the FXCop command-line executable FXCopCmd.exe exists. Arguments: Takes applicable arguments to run the FXCop command-line in console mode. /c – direct FXCop analysis to console or output window in IDE. /f:<file/directory> – where <file/directory> indicates the executable (EXE), or Dynamic Link Library (DLL), or a directory to browse for target assemblies. /p:<file> – indicates the FXCop project as the input parameter, and <file> refers to the corresponding FXCop project file. /s – Indicates FXCop to include the summary report with the informational message. /r:<file/directory> – Indicates the directory location where FXCop rules library is saved (typically “\Microsoft FXCop 1.32 RC 1\Rules”). This will load the entire rules library (.dll files) from the path, during the run. Initial directory: Path from where the FXCop command-line is launched. Mark the “Close on exit” and “Use Output window” check-boxes, and click on the “OK” button. The Arguments setting pointing to “FXCopDMSProject” is a system-wide environment variable. The FXCop project file will have the target assemblies added, default rules excluded (as applicable). During the run, the FXCop command-line will automatically load the entire included rules library (including the selected rule within them); hence we do not have to specify the rule directory location in the arguments. Navigate to My Computer -> Properties -> Advanced Tab. 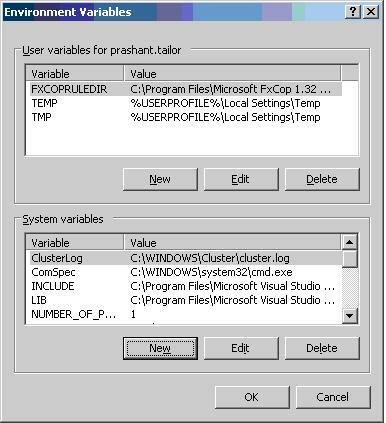 Note: Environment variables added under “System variables” are accessible to all users irrespective of logons, whereas a “Local Variable” has its scope limited to a specific logged-on user. Always create “System variables” type of environment variables. 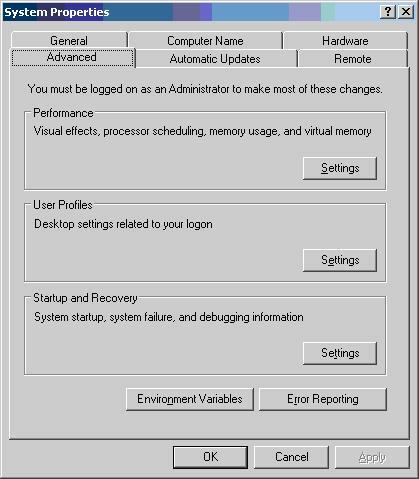 Re-start the PC for the variables to be read from the system environment, after they are created or updated. Similarly, system-wide environment variables can be added for the FXCop rule directory, if you are using the “/f” option. Let’s look at how to run FXCop from within the IDE. After having configured the “External Tools” settings, build your project and then click on “Run FxCop” under the Tools menu. FXCop works on the binaries; this means the developer needs to re-compile each time before the analysis is run. The analysis results will be posted in the “Output Window” with the rule name, code file name, and error details (as seen in the FXCop GUI). The developer can click on the relevant FXCop error and navigate to the source-code to understand the problem and then fix it. The fix can be made by the developer for the violations reported by the tool, and it can be re-run from within the IDE to ensure the code passes all the rules check, and then the code can be checked-in to the source-control repository. Creation of a new FXCop project. Modifications of existing FXCop project files to include/exclude rules (not applicable). Add/Remove target assemblies from a project file. Add custom project rules to a project. Hence, developers cannot configure an FXCop project from within the VS.NET IDE; they need to use the FXCop GUI to make any changes to the project file.